My first blogging event ever! 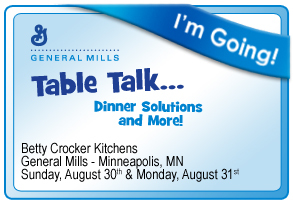 I was invited to visit the General Mills kitchens and sample new GM products. I was honored to attend with a group of mommy bloggers who blog about raising their kids, saving money, finding the best deals, cooking, and so much more. My teen’s reaction to my trip was funny. She immediately assumed that I was going to the Mall of America. No amount of assurance from me could convince her that I was not going. 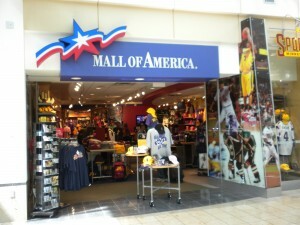 This store in the Minneapolis St. Paul Airport is as close I got to the Mall of America! I wandered about the airport for a few hours. I had a medicore taco from Maui_Taco, bought a few by-request souvenirs — a snowglobe and key ring for the preteen, a Northwest airplane and keyring for the kid, and nothing for the teen. The teen had no particular request, so she got a People Magazine to read…I might have read it while sitting waiting for my shuttle buddies to arrive. She’ll never know! After walking back and forth on the concourse for about an hour — my flight was very early — I decided to go and wait for the shuttle. I stood and watched as people got off the escalator. I’d look at the person and think “Is this person going to #tabletalk?” or “What about this one?” I tried to be discrete, but since I only knew a handful of people who were going by their twitter avatars well, it was a guessing game. At some point I noticed a person with a rolling suitcase and an iphone — I took a leap of faith and said “Are you going to #tabletalk?” Risks pay off. Not only was she going, but she was also riding in the shuttle arranged by the uber-resourceful @AZMelly. As we stood there waiting for the rest of the shuttle -ees, Leighann kept me updated on the plight of one #tabletak-er on a neverendig cab ride to nowhere. Latricia made it to the hotel…just barely. I pined for connectivity all trip…no iphone, no laptop…very woe is me. 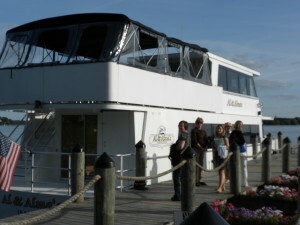 Once at the hotel it was a quick turnaround and onto a bus to our dinner cruise on Lake Minnetonka. The highlight of the cruise for me was not the food, or the lake views, or the fabulous lakeside homes. No all these were wonderful, but for me it was meeting the people that was the most memorable. You have to realize that I interact with many people online, but know only a handful IRL. I must be a better face-to-face communicator. 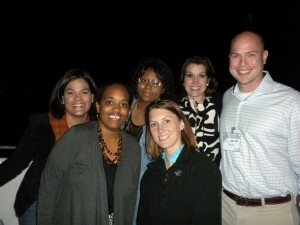 I had the pleasure of meeting the people shown in the photo above: MommyMo, 1stopMom, Suburban_Turmoil, Jennifer, and Toni, and Garland Hill who works with the Jolly Green Giant at General Mills. Not shown here: BusyMom and about 20 other mommy bloggers. Before I knew it the cruise was over, and we were headed back to the hotel. 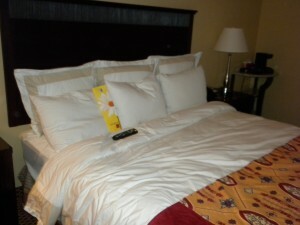 Comfy sheets, complimentary room service, monopoly over remote control, zzzzzzzzzz. I’ll blog some more about the purpose of my trip….the General Mills kitchens and sampling new products. ← Should 2-Year-Olds Go to Preschool?